So, upon some research, they turn out to be really two different things, although I can’t tell you why two of such similar products were ever invented without either one of which becoming obsolete. I found out that pandebono has corn flour on top of the cassava flour used in pan de yuca. They taste similar, but perhaps pandebono is milder and can retain moisture better because pure cassava flour can dry up easily. For foreigners who don’t yet have the instinct to distinguish a pandebono from a pan de yuca, use the golden rule (well, it will work most of the time if not all, anyway). Pandebono is more likely to be a stick, or a round bun. There are various unverifiable stories around the origin of pandebono. Bono can mean a certificate in Spanish. Sugarcane cutters were given certificates to claim a bun for lunch so the name, ‘bread of certificate’, emerged. 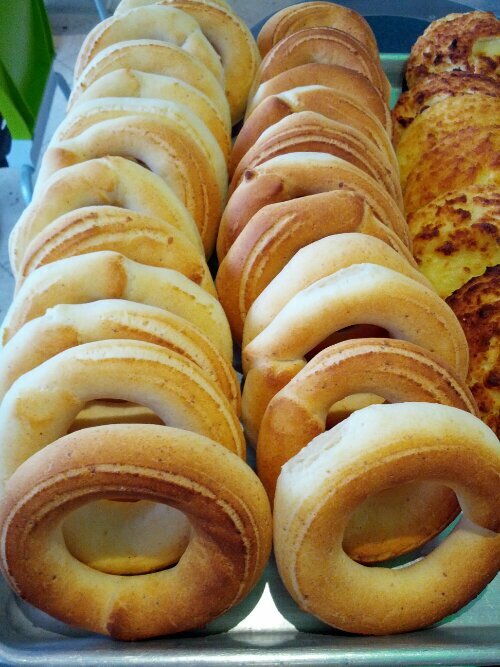 Others say that pandebono orginiated from Cali, the third largest city in Colombia, when an Italian baker started selling this type of bread, calling it pan buono (good bread in Italian). Then there is also the legend that suggests pandebono is from town called El Bono..